Without a doubt, fall is my favorite time of year. The bounty of Oregon’s harvest is plentiful, enabling me to fill every corner of my kitchen with freshly gathered foods that will be transformed into meals my family will gobble up with joyful jubilance. My husband, along with our two boys and I, relish in visiting our local farms this time of year – where I undeniably get as excited about selecting freshly picked Bodacious corn, Honeycrisp apples and Butternut squash as the boys do when they take the hay ride out to the pumpkin patch to select their pumpkins for Halloween. With the 2015 record-breaking growing season in Oregon’s agricultural industry, our cart was piled high with freshly harvested pumpkins, acorn squash, butternut squash, pie pumpkins, pears, peppers and tomatoes – plenty to keep us happy until our likely return visit within the next 2-3 weeks. 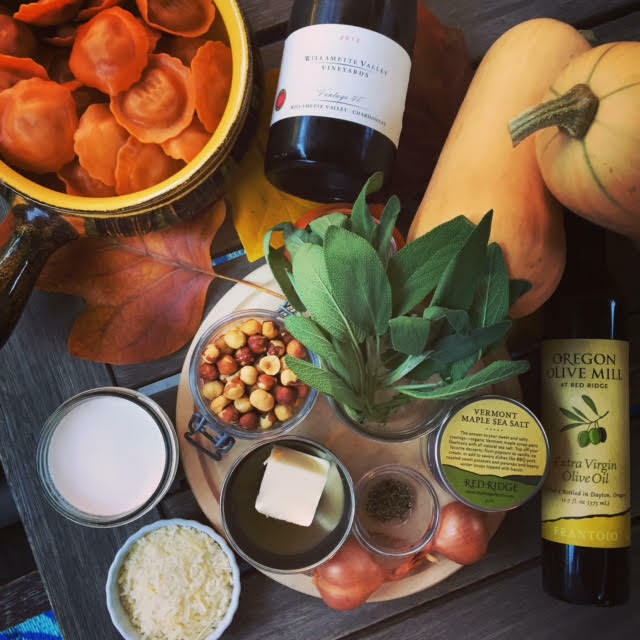 With the timely arrival of two incredibly special sample bottles of wine from Willamette Valley Vineyards (a 2013 Chardonnay and Pinot Noir from the Vintage 40 series), I immediately thought of a meal my Mom would make annually come fall: Butternut Squash with Sage Cream Sauce. 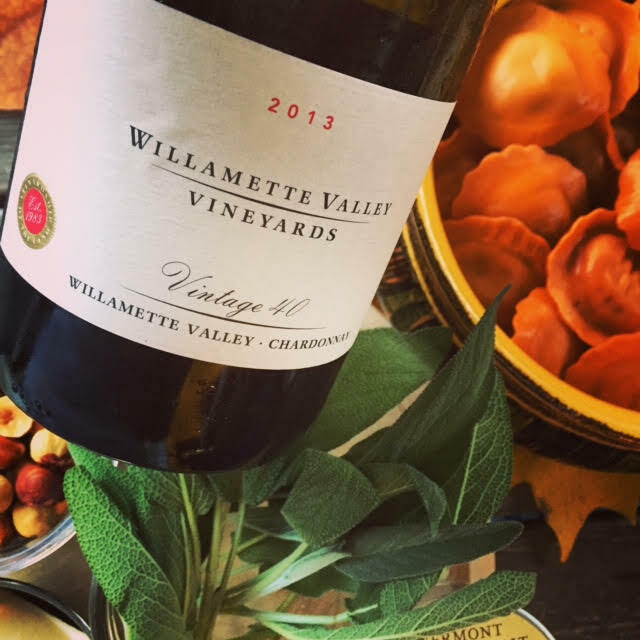 Although her recipe called for baked, cubed squash, I revised it; I mashed the squash to create a ravioli-based entree (rather than a side dish) and simply added the sauce to the ravioli – pure bliss with Willamette Valley Vineyards Vintage 40 Chardonnay. 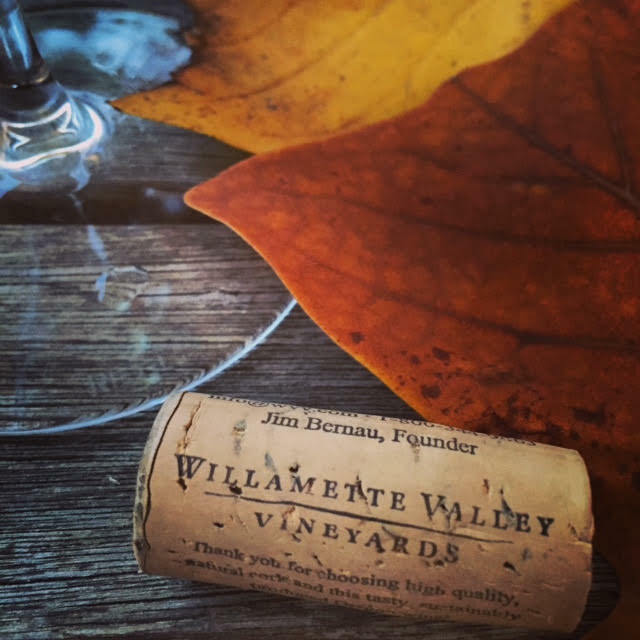 The Vintage 40 series Chardonnay and Pinot Noir from Willamette Valley Vineyards are not only special because they’re both phenomenal in quality, depth and complexity, but their shared label, Vintage 40, signifies the 2013 return of Oregon winemaking pioneer, Bill Fuller, founder of Tualitin Estate Vineyards. Fuller, now 78, merged with Willamette Valley Vineyards in 1997, when he retired. His 16 year retirement came to an end when he joined the winemaking team at Willamettte Valley Vineyards in 2013 and produced the Vintage 40 Chardonnay and Pinot Noir from his favorite blocks of fruit that he planted in 1973. Jim Bernau, founder of Willamette Valley Vineyards, credits Fuller’s vision and early plantings at Tualitin Estate Vineyards for making the difference in his winery’s growth. A remarkably notable figure in Oregon’s wine industry, Fuller’s Tualitin Vineyard 1980 Pinot Noir and 1981 Chardonnay took home “Best of Show” in both red and white categories at the 1984 London International Wine Fair, a success that had never been duplicated by any winemaker in the history of the competition. And his 1989 Tualitin Estate Chardonnay was the first Oregon wine to make Wine Spectator’s Top 100 List, taking place in 1992. 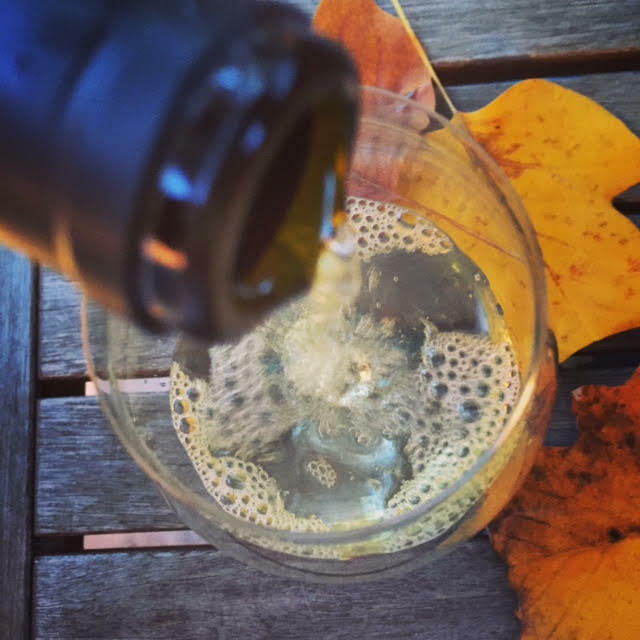 With fewer than 200 cases produced of each of the Vintage 40 wines, I savored every delicious sip of the 2013 Vintage 40 Chardonnay. Vibrant natural acidity is the backbone to this layered, complex beauty. Pears, apples and hazelnut cream are highlighted by lemon and lime zest that flows in waves from the front of the palate through to the lengthy, crisp, refreshing finish. 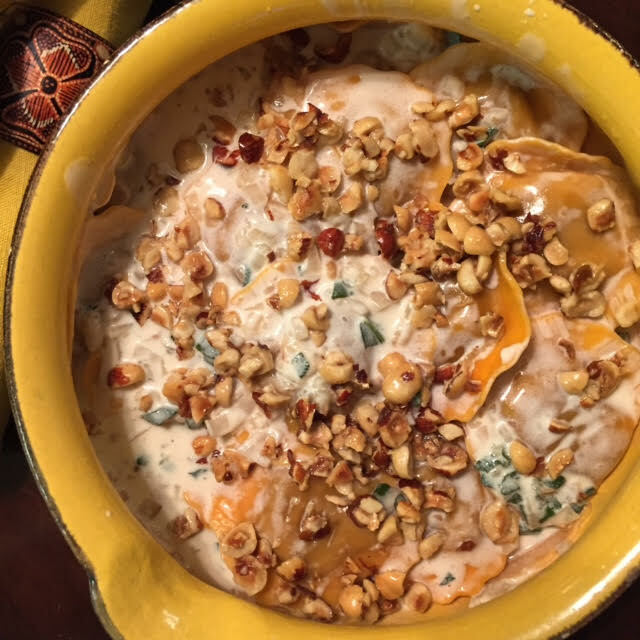 The flavors and texture were in true harmony with the Butternut Squash Ravioli. 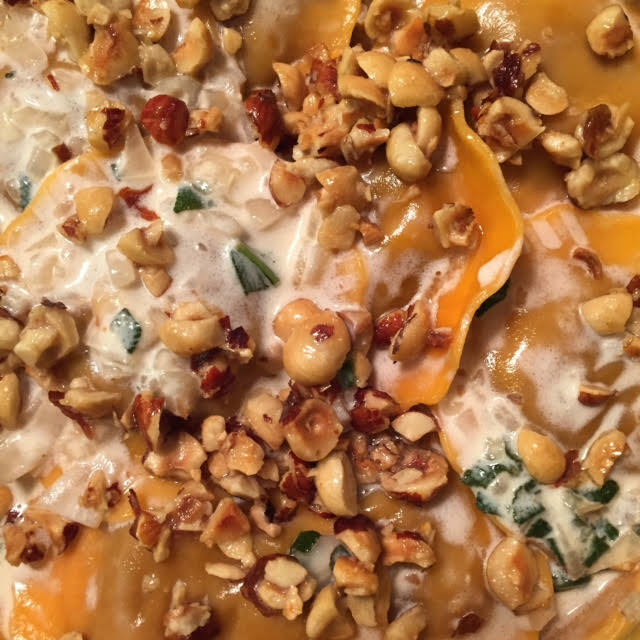 For the Butternut Squash Ravioli, I prefer to make mine from scratch using a recipe I found on allrecipes.com, but when I’m in a rush, I use Trader Joe’s Butternut Squash Ravioli. The sauce is all my mom’s. And my own spin is to top it with roasted hazelnuts (in Oregon we say filberts), and sprinkle it with Red Ridge Farms Vermont Maple Sea Salt. Melt butter and olive oil in skillet over medium-low heat. Add filberts and stir until aromatic. Transfer filberts to a bowl using a slotted spoon. Add sage and minced shallots to the skillet that was used for roasting the filberts. 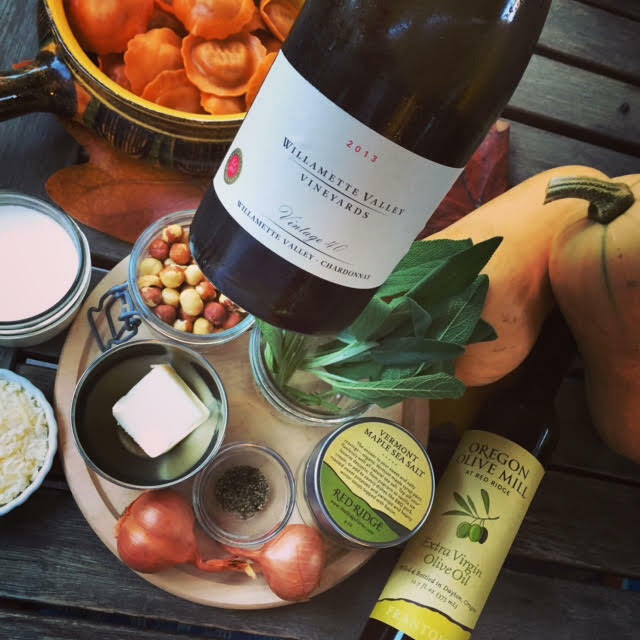 Sauté and add both the wine and heavy whipping cream. Bring to a boil until sauce is reduced to about 3/4 cup. Toss ravioli in with sauce and top with roasted filberts. Season with Red Ridge Farms Vermont Maple Sea Salt.